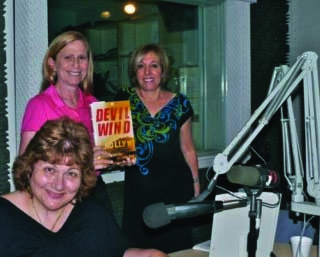 Our thanks to WXEL 90.7 FM and host Ann Bocock for a wonderful interview with my author friends Deborah Shlian and Linda Reid! And a special thanks to Denise Sears, the show’s producer. The interview is slated to run on the NPR station this Sunday, March 6th at 11 am, and can be heard streaming online at the WXEL website if you’re not in the Southeast Florida area. Deborah and Linda asked me to express their gratitude for the opportunity to talk about the upcoming release of my latest thriller adventure, Devil Wind, and to let everyone know about the wonderful folks at WXEL that made them feel so welcome before, during, and after the taping. Previous Guest Blogger Ilene Schneider tells how her character Rabbi Aviva Cohen met me (Sammy Greene) Next Linda has an electric car!